Thapa, the chief of the third largest party in the ruling coalition with 37 votes in parliament, further said that his party didn't join the government on the condition of voting in favor of the constitution amendment bill. KATHMANDU, March 14: Ruling Rastriya Prajatantra Party (RPP) Chairman and Deputy Prime Minister Kamal Thapa said that his party will not vote for constitution amendment bill registered by the government in the parliament. Speaking in an interaction at the Reporters Club on Monday, Thapa said that his party will quit the government if the amendment bill is pushed for endorsement in its existing form. “Rest assured that if the constitution amendment bill is put to vote in the current form, then RPP ministers will quit the government and vote against the bill,” said Thapa. The new cabinet member also claimed that RPP hasn't changed its policy and stance even after joining the cabinet. RPP has been expressing objection mainly over the revision of the provincial boundaries in the amendment bill, which was registered in parliament in November 2016. He further said that RPP's stance hasn't changed. He claimed that some people have been interpreting his decision to join the cabinet wrongly and spreading rumors about the party. He, however, reiterated that the agitating Madhes-based political parties should be brought on board the election process. “Environment should be created for bringing the Madhes-based political parties on board the election process,” he said. But, Thapa didn't say anything that how agitating parties can be persuaded to join the upcoming elections without addressing their demand for amending the constitution. He said that the local polls cannot be held without the participation of the Madhesi parties. Thapa was of the views that his party decided to join the government in order to help the prime minister to hold local elections. 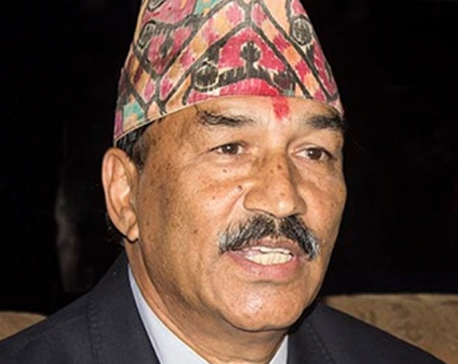 “If this government fails to hold the elections, RPP will be the first party to quit the government,” said Thapa.